This short animation looks at Bahrain’s current reliance on food imports to sustain its growing population. A food empire archipelago is formed through the acquisition of foreign arable lands. Yet, can Bahrain attain future food security by continuing its current practices? What are the possible opportunities for intervention on the island itself? Cambridge, is home to numerous world-class universities including Harvard and MIT and over 105,000 residents that can be broken apart into three distinct groups, professionals, a strong working class, and the largest segment with over 40%, the students. More so, the governing bodies including the city and the universities are plagued with misaligned interests exposed through their resource allocation and differentiation of waste streams. Through quantitative and qualitative research including numerous interviews with a variety of stakeholders including the “city”, MIT, Harvard, and a survey that was completed by over 180 students and residents across the city. The research showed that the city has been left holding the “bag” at the end of the day. From each stakeholder’s perspective, waste was merely a byproduct of inconvenience. This spans each socioeconomic group that was contacted, and each institution, no matter how large or small—it is a matter of convenience. 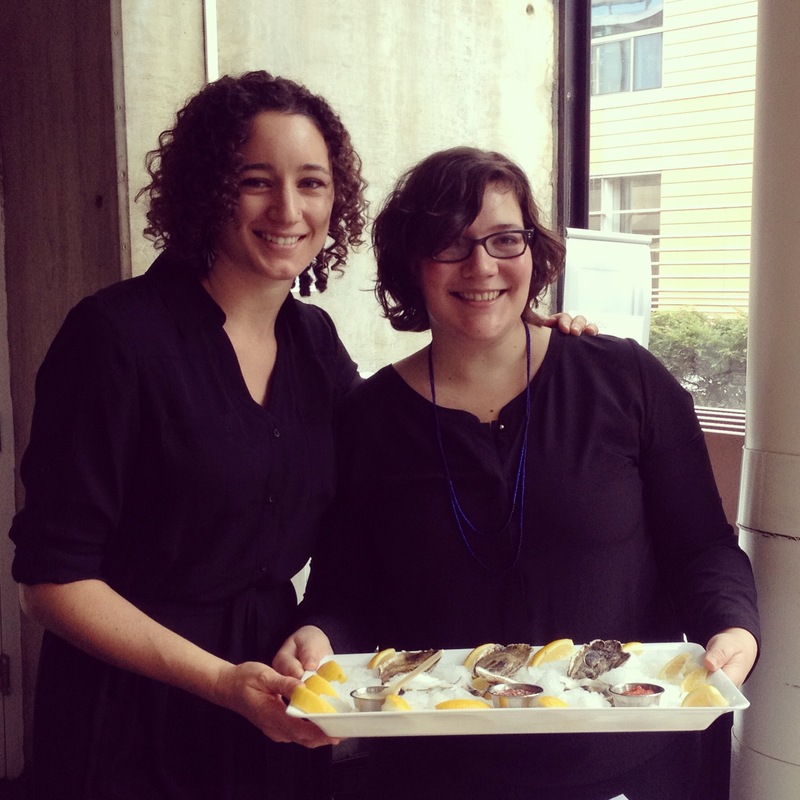 We brought Boston’s Oyster Culture in the form of oysters on the half-shell to our critics during our final review. Our review preparation was different this semester. Instead of perfecting boards and touching-up renderings, Jenny and I shredded horseradish and minced shallots for some classic oyster sauces. A half-hour before we presented, we shucked 22 oysters to serve. 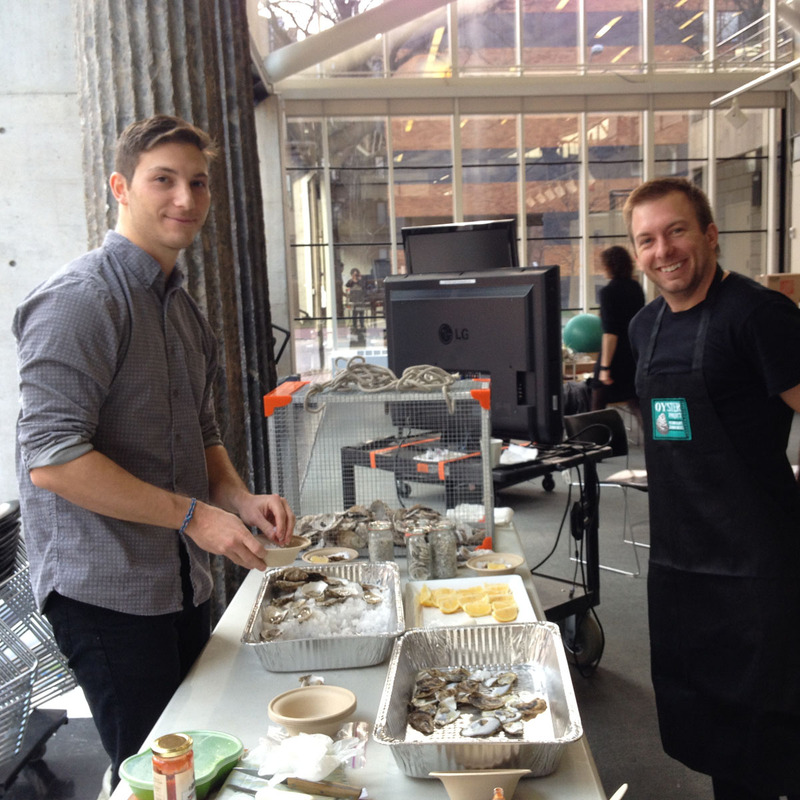 Deniz Bertuna and Chris Johnson help us with preparations for serving oysters on the half shell to critics. Aquaplot uses discarded oyster shells from local restaurants to sustain oyster reefs and a re-establish a healthy harbor ecosystem by establishing a city-wide oyster gardening program that closes the oyster waste stream, restores native oyster reefs, improves local water quality, and reconnects the people of Boston with their waterfront. We presented our proposal at our final review at the Harvard Graduate School of Design. During the review, we brought a bit of Boston’s Oyster Culture to the GSD with a live shucking demonstration and tasting session for our critics. This video was shown after our introduction to oysters and the potential use of their wasted shells. AQUAPLOT: an oyster garden proposal for Boston. from Kelly Murphy on Vimeo. To many people, Boston is synonymous with shellfish, especially oysters. Oysters have always been a cornerstone of the New England diet, and were once a mainstay in the Boston harbor. Oyster reefs were a crucial element of the underwater landscape that filtered our estuaries and maintained our harbor as a rich natural resource area. 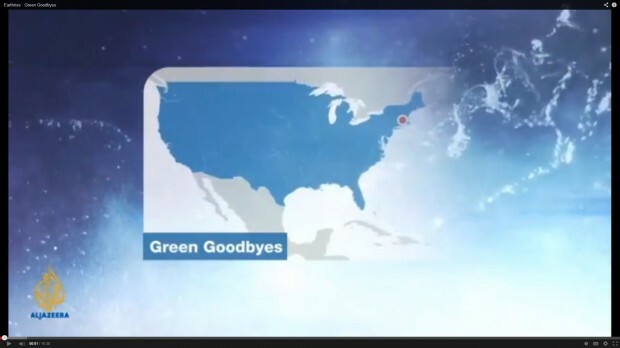 They not only clean water, but also act as shoreline buffers that dissipate wave energy. What’s more, they support critical fisheries by providing habitat for numerous fish and crustacean species. Oyster reefs, however, are now the most severely impacted marine habitat on Earth: over 85% have been lost globally. In today’s context we hear a lot about oysters, whether it’s their ability to bolster coastlines in the face of climate change, their water filtration capabilities (the average adult oyster can filter 50 gallons of water per day), their potential for remediating eutrophic waters, or the food culture surrounding their consumption. There is, however, an important gap in this discourse: what about the waste associated with their consumption? What happens to oyster shells once they’ve been discarded? Most people don’t recognize the magnitude of waste associated with discarded oyster shells once they’re consumed. In Massachusetts alone, 4.1 million pounds of oysters were harvested last year. Over 40 restaurants in Boston serve oysters, lending a distinctive identity to our city. Each restaurant generates around 20 pounds of oyster shell per day. Together, this totals over 300,000 pounds of oyster shell per year in Boston alone. Of these 40+ Boston restaurants, only 4 recycle their shells, meaning that 90% of shells are currently landfilled. Why? Because Boston doesn’t yet have a place for its shells. How do you use discarded shells to sustain oyster reefs and a re-establish a healthy harbor ecosystem? By establishing a city-wide oyster gardening program that can close the gap in the oyster waste stream by creating demand for discarded shells. Oyster gardening can simultaneously restore native oyster reefs, improve local water quality, and reconnect the people of Boston with their waterfront. There are a number of successful precedents for oyster gardening programs around the region. There is no reason why Boston shouldn’t be at the forefront of oyster gardening given its rich heritage. Oysters are relevant to the economy of the city and represent a local heritage that people are extremely proud of. While Boston is known for its shellfish, however, it is not performing well on the shell recycling front. Within this broken cycle lies an opportunity for the Boston to address two key problems: wasted shells and oyster reef decline. While there are numerous productive uses for discarded oyster shell, the best use by far is as reef substrate to grow juvenile oysters. The link between the two problems presents an exciting opportunity to propose a better system. The waters of the Boston Harbor are currently closed to shell fishing due to the risk of oysters being harvested illegally in polluted waters. However, nursery areas for shellfish seeding projects are permitted if they are transplanted to approved waters. Over the last three years, the Massachusetts Oyster Project has proven that oysters can survive in Boston Harbor. In just a few years, oyster gardeners could use discarded restaurant shells to grow thousands of oysters in the Boston Harbor and re-stock endangered reefs in the region. The benefits of oyster gardening are manifold, and span environmental, economic, and social realms. Oyster gardening connects the waste source to the solution, revives Boston’s local heritage, reconnects people with their waterfront, and brings life back to Boston Harbor.